There is a common thread that runs in all major powerful families of the world and that is their fascination for Natural and fine Gemstones. 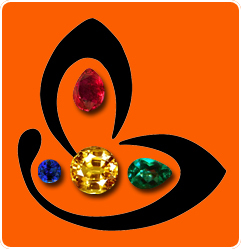 These Gemstones are not only valued as an investment tool but if you delve deeply each family that has made a mark on this world has a history of a powerful Gemstone attached to it and also attached is the story of the Gemstone. Featured here is the famous Rockefeller Blue Sapphire. The stunningly beautiful and heart stopping Rockefeller Blue Sapphire was originally owned by the last Nizam of Hyderabad Asaf Jah VII-Mir Osman Ali Khan who at one time was supposed to be the richest man in the world. Subsequently it was purchased by John D. Rockefeller Jr. The only son of John D. Rockefeller Sr. in 1934. It was then held by the Rockefeller family till 1971. Contrary to majority of beliefs the Rockefeller Blue Sapphire is actually Burmese in origin even though the rich cornflower blue color suggests that it of a Kashmir Mine. Internally flawless and weighing 62.02 carats with highly saturated intense Blue color it has been fashioned into a rectangular step cut. Internally flawless with great clarity levels, this famous blue sapphire fetched $ 3 million at Christie’s, New York City, auction on April 11, 2001. I found your blog around 3 months back from the American Gem society page on Facebook and since then follow it regularly. I don’t know much about how Astrology and Gems are linked but I come here to view the fantastic natural gemstones that you feature and the lucid and innovative style with which you write about the features and benefits of each piece of Jewelry. I am studying to be a GG from the GIA and your posts have helped me a great deal. I have one more picture of the Rockefeller Sapphire from a different angle that I shall send across. Great Blog and Great Website!